see April News for latest update…..more information to follow. Kin-Hin; managed and owned by Karen & Sivan, relocated in December 2015 to Pachalloor close to The Lagoona Beach and Beach & Lake Resorts. 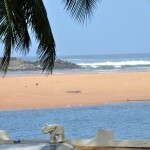 Kin-Hin is about 10 min drive from Kovalam and the setting is idyllic! Situated between Trivandrum and Kovalam – by the Arabian Sea and the Karamana river,a peaceful location with stunning views. 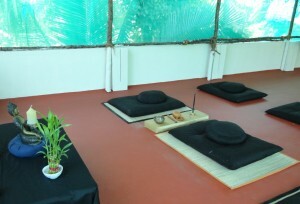 Kin-Hin offers a unique home stay experience with meditation sittings in Zen tradition and yoga classes with your hosts on the roof top. Just 2 guest rooms allows for a personal, friendly, home atmosphere and/or a personal retreat space. Kin-Hin is a zen meditation centre established in the summer of 2012 and inaugurated by Zen Master AMA Samy on December 10th 2012. Kin-Hin is the term given to the walking meditation that is practiced between periods of the sitting meditation known as zazen. 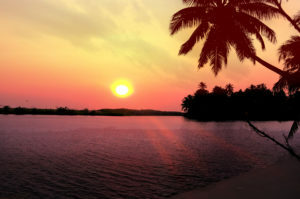 It is the ideal place to come for a relaxing holiday away from tourist crowds yet close to the beaches of Kovalam. 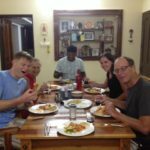 You can experience village life and get helpful information and tips from your hosts Karen and Sivan. Karen is English, a meditation instructor and a qualified Laughter Yoga teacher living in India since 1997. 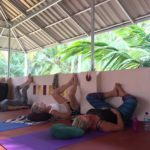 Sivan grew up in Pachalloor, is an experienced yoga teacher in India and Europe, a great masseuse and has a wealth of local knowledge about the area and its customs. You are most welcome to attend ‘sittings’ (free of charge) for it was said by Koun Yamada in his book The Gateless Gate that “to sit zazen alone is so difficult it is almost impossible. For effective Zazen it is very important to practise sitting with a group, at least occasionally, if you want to get results”. Kin-Hin is in Pachalloor, between Trivandrum and Kovalam – by the Arabian Sea and the Karamana river,a peaceful location with stunning views. HOME STAY. Kin-Hin (being a private home) is primarily a non-residential Zen centre, although accommodation is available for house guests in 2 rooms on the upper floor. Perfect for those that prefer to stay away from the main tourist area, experience Indian village life and have a personal retreat space. 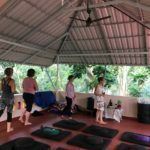 SOLO RETREATS and PERSONALISED COURSES are possible on a one-to-one basis if you would like to experience/learn about meditation and zen practise privately. According to interest, there will be some full day ‘Zazenkai’s’: a more intensive period of meditation with a talk about Zen and an opportunity to ask questions and talk with each other. I also offer short courses on a one-to-one basis if you would like to experience/learn about meditation and zen practise privately. See ZAZENKAI for programme details and see News or the latest updates! In keeping with spiritual custom, I do not wish to make any charge for the daily meditation practise. In order to help the centre grow and to keep it running, donations of any amount will be gratefully received. 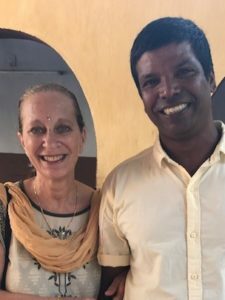 A little about me; my name is Karen and I came to India in 1997 for a three week holiday and decided to make Kerala my home. 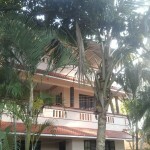 For 10 years I ran yoga & massage holidays in Kovalam. From 2007 until mid 2012, I lived, worked, served and followed Zen at Bodhi Zendo, blessed to have guidance and support from Zen Master AMA Samy. I had thought I might never leave Bodhi Zendo, yet the time did come for for me to move on, return to the ‘marketplace’ and begin a new chapter with ‘Kin-Hin’. Then in 2014 I returned to UK in order to care for my mother. When she passed away I decided to come back ‘home’ and reopen Kin-Hin in Pachalloor. I am a qualified aromatherapist with over 20 years’ experience. My diploma in Holistic Aromatherapy was obtained from The Tisserand Institute in London in 1993. In 2013 I studied with Dr. Kataria in Bangalore at The School of Ancient Wisdom and completed a teachers training course in Laughter Yoga. HaHaHa! In his article, the reporter described ruefully how the teacher had scolded him for this remark. ‘It is not a question of being the green- grocer’s wife or being a Cabinet Minister, but of not being a green- grocer’s wife and not being a Cabinet Minister. We teach archery here. She has to shoot herself out of being the greengrocer’s wife into the Buddha-nature which she really is, and he has to shoot himself out of being a Cabinet Minister into the Buddha-nature which he really is. And it may very well be,’ added the master, ‘that it will be easier for her to shoot herself out of being “only the greengrocer’s wife” than it will be for him to shoot himself out of being “His Excellency the Cabinet Minister”.